This article explains how to list all the packages available in an Ubuntu, Linux Mint or Debian repository (installed and available for install), be it an official repository or a third-party source like a PPA, and so on. Below you'll find 2 ways of listing packages from a repository: using a GUI or from the command line. If you want to list all the packages in a repository on your desktop, you can use Synaptic Package Manager. 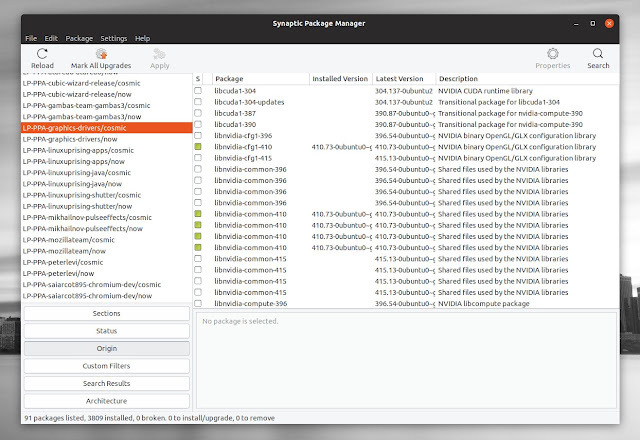 Synaptic is a graphical package management application for APT (APT being the main command line package manager for Debian and its derivatives). To list all the packages in a particular software repository using Synaptic, launch the application and click on Origin in the bottom left-hand side of its window. 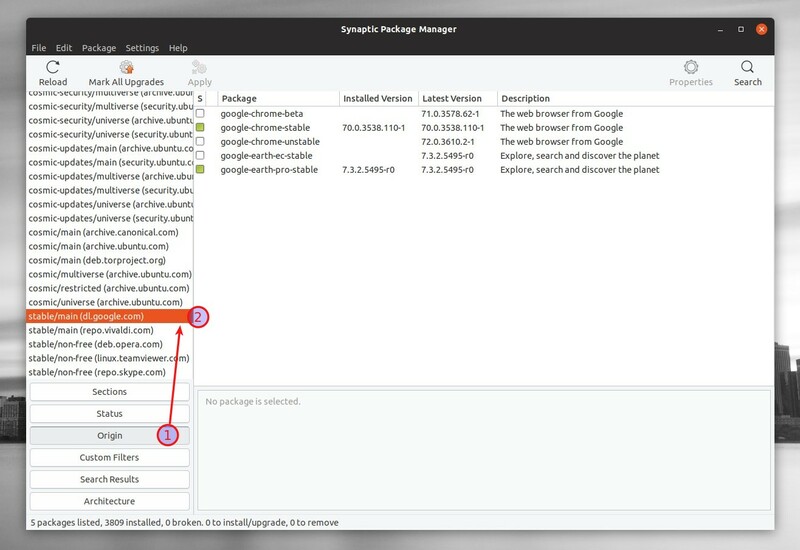 Next, select the repository for which you want to list all available packages (both installed and available for installation) from the list that's displayed in the left-hand side of Synaptic Package Manager. As you can see, all the software sources are listed here, including the official repositories. Launchpad PPA repositories are supported as well. Their name begins with LP-PPA, followed by the actual PPA name. Synaptic lists 2 entries for each PPA - make sure you select the PPA entry ending with /ubuntu-codename, for example /bionic, /cosmic, etc. The entry ending in /now doesn't list all the available packages in the PPA. I'm not sure why, but some packages are listed multiple times for PPA sources (and only for PPA repositories). That only a display thing, and it doesn't break any functionality. Listing all packages in a repository from the command line in Ubuntu, Debian or Linux Mint is a bit tricky, but still quite easy to do. For short queries, some unrelated repositories might be displayed, but it's still easier to see what you're looking for using grep than listing all the repositories _Packages files. Use the file containing the architecture for which you want to list all available packages in that repository. The example above is for 64bit (amd64), but you could use i386 for 32bit, etc. To use this with other PPA repositories, replace linuxuprising with the first part of the PPA name, and java with the second part of the PPA name, and the command will list all the packages from that PPA (both installed and not installed). For easy access, you could bookmark this command using Marker commands bookmark manager (while used primarily for searching, HSTR can bookmark commands as well).